Ever since he was reinstated in the NFL, Michael Vick has been the model citizen. His career was derailed when the media discovered he allowed dog fighting in his home. This discovery cost Vick his home and his career with the Atlanta Falcons. Fans were already growing upset with his inability to win. During his time away from the NFL, Michael Vick worked on repairing his image. Taking a page from T.I. 's notebook, Vick teamed up with BET. The network granted him his own documentary series. Vick was shown in a different light in this series, making new fans. Upon getting out of prison, Michael Vick teamed up with former championship NFL coach, Tony Dungy. The former Colts head coach helped Vick make a successful plea to the NFL. He mentored Michael Vick and he helped him stay in shape. With Tony Dungy's help, the NFL reinstated Vick before the start of the 2009 season. Following much stalling from several NFL teams, the Philadelphia Eagles signed Michael Vick to a short-term contract. Because their famed quarterback, Donovan McNabb, was injured, they needed a quarterback to help them. Michael Vick ended up being their choice and soon became the face of the franchise when they decided to trade McNabb away. 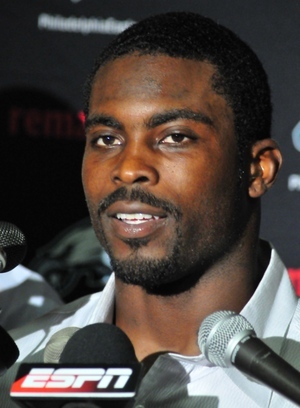 Recently, Michael Vick was called a "hero" by The Southeastern Virginia Arts Association. Now, he has landed his first endorsement deal since 2007. Michael Vick lost everything in 2007, including his endorsement deal with Nike. Vick is now sponsoring Core Synergy wristbands, along with several other players in the NFL.